Search engine optimization is the technique of bringing your site top in search results pages. Whatever the powerful content you write, your WordPress sites needs a push to rank top in search engines. Here is a WordPress SEO guide for beginners. This guide is targeted for new users and most of the improvements can be done by yourself. We strongly recommend not to rely on external SEO agencies and pay large amount of money to them. We have also consolidated the complete guide in an attractive PDF eBook format. You can download for free and read it offline. Download your copy of WordPress SEO Beginners Guide for free. WordPress by default supports most of the SEO techniques but it is unavoidable to use plugins to improve SEO. In this article we explain some of the sections with three plugins – Yoast WordPress SEO, Redirection and WP-Smush. You can also use any other plugins to get similar features. When your site is under development or during the migration from local server to live environment it is a common practice to hide the site from search engines. Once your site is completely ready for live world, don’t forget to deselect the search engine visibility checkbox “Discourage search engines from indexing this site” available under “Settings > Reading”. This setting will allow search engines to crawl and index all pages on your WordPress site. WordPress by default uses numbers for URLs like http://www.yoursite.com/?p1. These non-descriptive URLs are called ugly URLs and not useful for users and search engines. In order to make your URLs more user / search engine friendly, you need to activate pretty permalinks so that your URLs will be in a readable format. 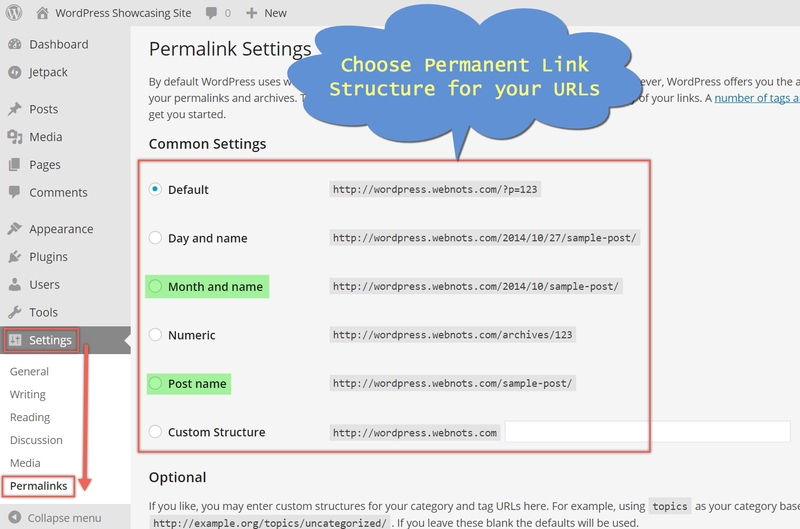 Enable the required permalinks structure under “Settings > Permalinks” menu from WordPress admin interface. Ensure to add and verify your WordPress site in Google and Bing webmaster tools account. This informs the search engines that the site is reliable and have a verified owner. All SEO plugins offer automatic creation of XML Sitemap for your WordPress site. Once the Sitemap is created, ensure to check the Sitemap is accessible on browser and submit the same to webmaster tools account. Though installing Google Analytics will not directly impact your SEO, it helps to monitor the site’s performance. Analytics offer huge reports with different parameters which you can monitor and take corrective actions. Instead of Google Analytics, you can also use simple statistics tools like Jetpack Stats to monitor the traffic status quickly. Using Jetpack Stats you can not only monitor the stats using WordPress mobile apps but also check the downtime which Google Analytics does not provide. You may be changing the URL of blog posts and pages during the time of building your site. If not redirected properly any links to old URLs will result in “404 page not found” error. It is recommended to set the auto redirection for modified posts so that you will not loose search engine ranking of the old post URL. You can do this easily with the popular “Redirection” plugin. Your post title is displayed on search engines results as a first line and attract users to click on it. Use descriptive titles less than 65 characters so that it can fit the search engine display screen. Your site title will be displayed after the post title in search engines, so use your site’s brand as a site title with appropriate separator. It is recommended to use “Yoast WordPress SEO” plugin so that the search snippet view can be seen before publishing the post and necessary adjustments can be done without hassle. Generally speaking there is no need of worrying about keywords if the content is appropriately written. For example, an article talks about dogs should automatically contains the word “dog” fewer times along with the word “dog” appear in heading. It is not harm to check the appropriate usage of keywords with the easy to use plugins. Yoast WordPress SEO plugin offers built-in feature to view the SEO analysis of your page before publishing. The analysis meta box is shown on each post and page with lots of insights like the usage, readability, density, etc. Use your keyword in meta description. Use appropriate length (less than 155 characters) so that the paragraph will not get truncated when displayed in search engine. Ensure to avoid duplicate meta description for multiple posts. WordPress does not provide default feature to hide only certain pages/posts from search engines. For example, you may not want “Thank you page”, “Newsletter” or “Archive” page is indexed in search engines. You need to use plugins to set those pages as “No-index” and “No-follow” so that search engines will not crawl those pages or you need to modify “robots.txt” to set such rules. Individual posts can be hidden from search engines using Yoast WordPress SEO plugin. Also you can disable all unnecessary archives like author archives and date archives. Learn more about SEO for crawlers. Be default WordPress updates certain services whenever you publish a new blog post. You can add your own ping list under “Settings > Writing” to update the needed services so that people can find the latest content of your blog quickly. Creating a normal text and image hyperlinks within content. Always use descriptive anchor text for links instead of using text like “Click Here”. Similar to internal links, it is also good idea to link quality external links related to the article. Ensure all your images are attached to a post and you are redirecting attachment URLs to parent post. This will ensure users are redirected to content page instead of ending up viewing an image. Always add “Alt Text” to all images so that search engines can understand the meaning of the images. Use plugins like WP-Smush to optimize the images so that the page can load faster. No one likes the slow loading page including search engines. Check your site with Google PageSpeed Insights tool and take corrective actions suggested. Google and other search engines check the mobile-friendliness of your site and decide the ranking accordingly. Hence it is mandatory to use responsive themes or separate mobile site to ensure your WordPress site is mobile-friendly and rank higher. 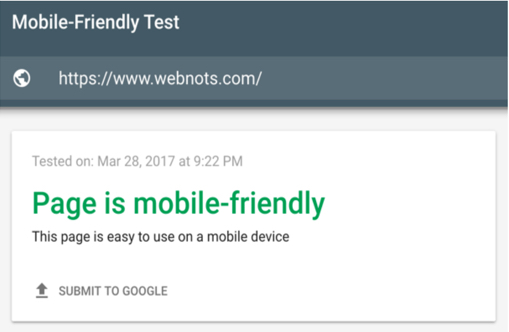 Use Google mobile-friendly tester tool to check your site is complying to the requirements. Great post! You have a lot of helpful tips there. Thanks!